The WHITE WINE GAMETM is an adult board game that combines wine, food and strategy to produce fun. 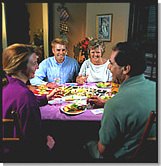 You provide a bottle of any white table wine, your choice of four food items and 2 to 6 adults. The WHITE WINE GAMETM provides the strategy and the fun. New! WHICH WINE IS THIS?TM Challenges and Posters now available featuring red and white wines. Challenge yourself. Challenge your friends. Any number from 1 to 100 can play. Visit www.whichwineisthis.com. Have fun and experience a stimulating strategic challenge while enjoying your favorite wine. No prior knowledge of wine is necessary to play. Wine enthusiasts and beginners can play the game together without either person having a major advantage. Learn more regarding wine and great food and wine pairings. Make the game a unique experience each time you play by varying the wines and food items. A great way for wine enthusiasts to share their passion in a way that is fun and educational for everyone. Game includes 40-page booklet, Tips For Enjoying Wine And This Game...Recipes For Complementing Wine And This Game with suggestions for selecting and serving wine, descriptions of 30 types of white wine and recipes for 45 food items. Call (402) 486-1601 or use our online order form to order the WHITE WINE GAMETM for $49.95. FREE SHIPPING. Questions or comments? Send us E-mail at info@whitewinegame.com or call Parstone directly at (402) 486-1601.